Did you know that the NFL had a rotating trophy in the years before the Super Bowl? How do we know this? 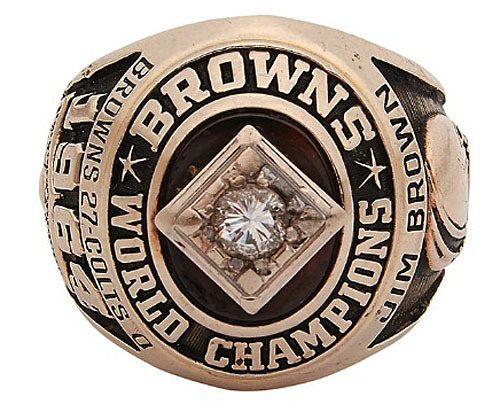 Well in 1995 when it was determined that Cleveland was to keep the Browns team colors, records, etc., there was no championship trophy for 1964. In fact, in more ways than one, they left it in Green Bay following a loss in the 1965 NFL Championship Game. Following the 1965 season we started the Super Bowl series where teams kept a trophy to commemorate the accomplishment…but there were rings. This was the last championship won by the lake. So yes Jim Brown did play for an NFL Champion during his career. The team was quarterbacked by Frank Ryan who went on to be a college professor and designed the first electronic voting system for either US Congress or the House of Representatives…the memory escapes me. He threw for, then a career best, 25TDs as he completed 174 of 344 for 2,404 yards. On a par with what Norm Van Brocklin and Bart Starr had thrown for in 1960-62 winning championships. In fact, aside from Earl Morrall’s 26TDs in 1968, this was the most for an NFL Champion QB during the 1960’s. The Ed Thorpe NFL Championship Trophy for 1965. No one knows where the one all the teams held is. A uniquely forgotten team amidst the slew of Green Bay Packers championship teams throughout the decade. Brown as he had in 8 of his 9 seasons led the league in rushing with 1,446 yards and 7 scores. His punishing runs were the bludgeoning focal point of the Cleveland offense. No one knew he was just a season away from retiring as the NFL’s all time leading rusher with 12,312 yards. However the 3 time MVP had some help as #1 draft pick Paul Warfield turned in a rookie season for the ages. In what would be a Hall of Fame career, Warfield hauled in 52 passes for a team record 920 yards and 9 scores. He was the deep threat the team had been missing since Dante Lavelli. With Collins coming off of a 1963 where he had a team record 13 TD receptions, teams were in a quandry. Teams keyed on Brown and tried to slow #86 but the addition of Warfield made Cleveland’s offense lethal. Does he deserve Hall of Fame consideration?? Ironically, the team that bears the name of Paul Brown, won this championship without him. In a power struggle he was removed by new majority owner Art Modell and replaced by Blanton Collier. More irony can be found in the fact that in Cleveland 4 years later, the Colts got revenge shutting out the Browns 34-0 in the NFL Championship Game on their way to Super Bowl III. Then the obvious irony of losing not only their last NFL Championship appearance to Baltimore, but then lost their original incarnation as a franchise to Baltimore when Art Modell moved them there following the 1995 season. However in 1964 they were league champions and went on to defend that title in 1965 against Green Bay at Lambeau. This was also the team of the 1950s and is the only team in league history to win an NFL title in their first year in the league. Further food for thought: What was first IRRESPONSIBLY taught to the masses as the “West Coast Offense” was the 1950s playbook of Paul Brown’s from Cleveland and taught to Bill Walsh in Cincinnati. In fact the most famous play in “west coast offense” history, the pass to Dwight Clark from Joe Montana in the ’81 NFC Championship Game, was an old Cleveland Brown play called Q-8 option and NOT sprint right option. Thanks for reading.. please share the article. 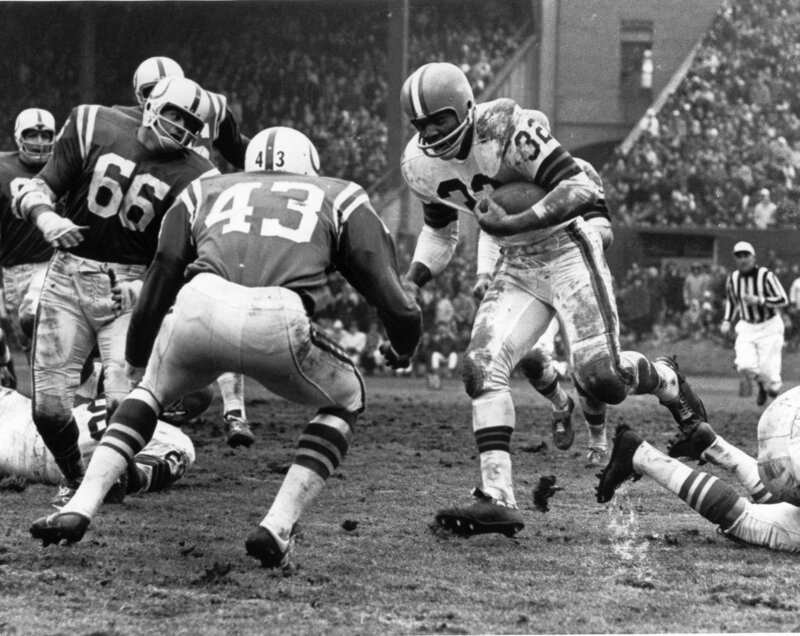 Jim Brown about to collide with Lenny Lyles during the ’64 NFL Title Game. This was the last championship won by the lake. So yes Jim Brown did play for an NFL Champion during his career. The team was quarterbacked by Frank Ryan who went on to be a college professor and designed the first electronic voting system for either US Congress or the House of Representatives…the memory escapes me. A uniquely forgotten team amidst the slew of Green Bay Packers championship teams throughout the decade. Ironically, the team that bears the name of Paul Brown, won this championship without him. In a power struggle he was removed by new majority owner Art Modell. They were coached by Blanton Collier. More irony can be found in the fact that in Cleveland 4 years later, the Colts got revenge shutting out the Browns 34-0 in the NFL Championship Game on their way to Super Bowl III. Then the obvious irony of losing not only their last NFL Championship appearance to Baltimore, but then lost their original incarnation of the Browns to Baltimore when Art Modell moved them there following the 1995 season. 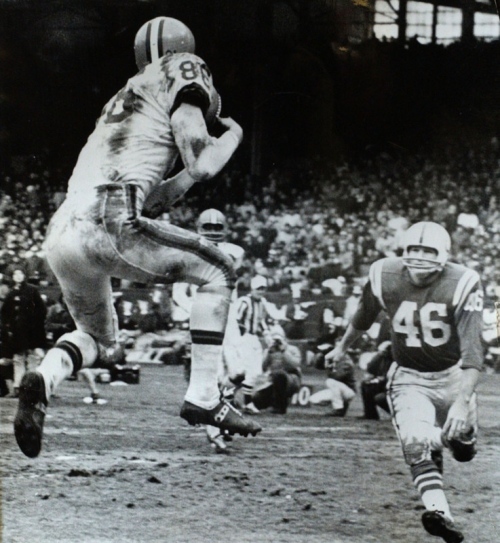 Gary Collins snares one of his three TD receptions in the ’64 NFL Title Game. However in 1964 they were league champions and went on to defend that title in 1965 against Green Bay Packers. This was also the team of the 1950s and is the only team in league history to win an NFL title in their first year in the league.